You’re looking for a car that does all the right things to fit perfectly into your active lifestyle. You’re on the go. All the time. Your Fitbit® life is in fast-forward, and you need a car that can keep up with your busy schedule. You’re not looking for a pricey luxury-yacht or mega-SUV. And while a hot two-door roadster would be a blast to drive, it doesn’t have the practicality you need. You work hard for your money and want to keep as much of it as possible. So a car with great gas mileage should be high on your “must-have” list. Technology? Oh yeah, that’s a big one. You want the equivalent of a “smartphone on four wheels” so you can stay connected wherever you go. And you’re probably looking for a conveyance that just doesn’t get you from here to there and back, but something that will actually put some fun in your daily commute or trip to the mall. You live life spontaneously, and you want a car that’s ready to hit the road at a moment’s notice when the urge to text your friends and say “let’s head to the mountains this weekend” strikes you. And speaking of friends, you want a car roomy enough to haul you, plus your friends, plus your gear without feeling cramped. Appearance matters to you. So driving a car with stylish, contemporary looks is important. You don’t want to roll up to the club in a boring econobox that’s as old school as yesterday’s Twitter feed. Eeww! You probably figured out by now that we’re going to suggest the perfect car for you at this point. And if you bothered to read the headline, you already know that we’re talking about the 2016 Honda Fit Hatchback. It should also come as no surprise that the Honda Fit fits right into everything we’ve been saying at this point. Okay, we admit we’ve been a teeny bit manipulative here. But hey, we’re not ashamed at our enthusiasm for this hot-looking, best-selling, do-it-better-than-anyone-else hatchback. Our goal is that you’ll be saying “I should check this car out” by the end of this blog. That’s all we can ask. Well, not really. We can ask you to buy the Honda Fit from one of our Valley Honda Dealers. But, hold on, we’re not quite there yet. Let’s start with styling. There’s an old saying that “beauty is in the eye of the beholder” (said by Margret Wolfe Hungerford in 1878 in case you are keeping score). There’s another old saying that “a picture is worth a thousand words” said by…oh, never mind. So check out the pix of the new 2016 Honda Fit and we think you’ll agree that it’s one sharp-looking, fresh, and modern urban commuter with lots of personality that you’ll be proud to own. The Fit’s smallish exterior dimensions are deceiving. You’d expect that there’s not a lot of room inside. But in fact, you’ll find the Fit’s cabin to be surprisingly roomy for its diminutive size. And it’s amazingly flexible, too. You can manipulate the Fit’s 52.7 cu. ft. of interior space many different ways to suit your needs of the moment. Honda’s exclusive fold down 2nd-row “Magic Seat®” is the wizardry behind this remarkable flexibility. In “Utility Mode,” it folds flat, giving you enough room for those larger items, which means you may just have to help your friend move across town. Again. Switch to “Long Mode” by folding the front passenger seat flat for those extra-long items like the camping gear you’re taking to the mountains. “Tall Mode” lets you carry those tall, awkward items like lamps, for example, by folding the bottom of the Magic Seat® up. In “Refresh Mode” you fold the front passenger seat back and remove the headrests, stretch out, and chill. You can also plus your ride with available leather seats, a power moonroof, sport alloy wheels, and a smart entry key fob with push-button start/stop. The 2016 Honda Fit for sale in Phoenix at your Valley Honda Dealers is as tech-savvy as they come. 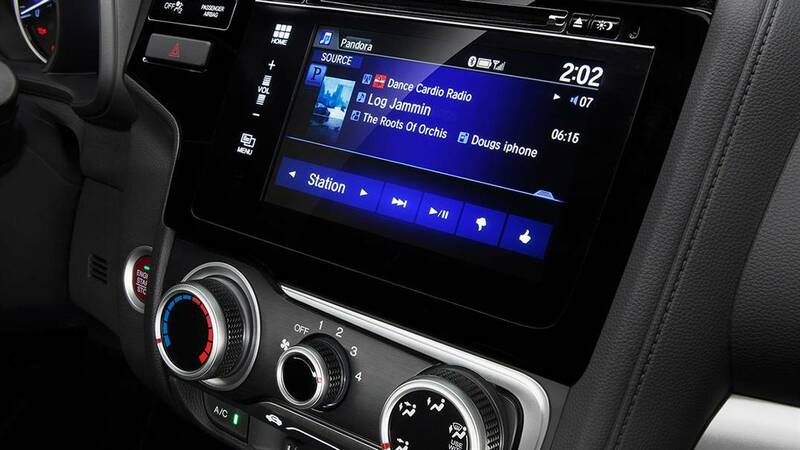 All models come with standard Bluetooth® Streaming Audio and a handy USB audio interface. You can step up to the EX, EX-L and higher models which get you SiriusXM® Radio, Pandora®, HD Radio®, and a 7-inch color touchscreen display. HondaLink® Next Generation is an app you download to your compatible smartphone that lets you touch, pinch, and swipe through your playlists, listen to podcasts, and access other functions. Bluetooth® Hands-Free Link® and SMS Text Messaging let you make and receive calls and have your texts read to you. The Honda Fit has all the power and handling you need for fast merging and passing, as well as for taming those twisty roads. Lightweight and nimble, the Fit is motivated by a spirited 130-hp, direct injection, i-VTEC® 4-cylinder engine that gets exceptional gas mileage. Use the Fit’s exclusive Eco Assist™ and ECON™ button to bump your fuel economy to an EPA-estimated 41 mpg highway/33 mpg city. So leave your gas card in the glovebox and head out on the highway. The open road awaits your next adventure. Most importantly, the Honda Fit is a safe and reliable car you can depend on. The Fit’s array of cutting-edge safety features includes a multi-angle rearview camera, daytime running lights, tire pressure monitoring system, Vehicle Stability Assist with Traction Control, impact-absorbing ACE™ body structure and multiple, dual-stage airbags. 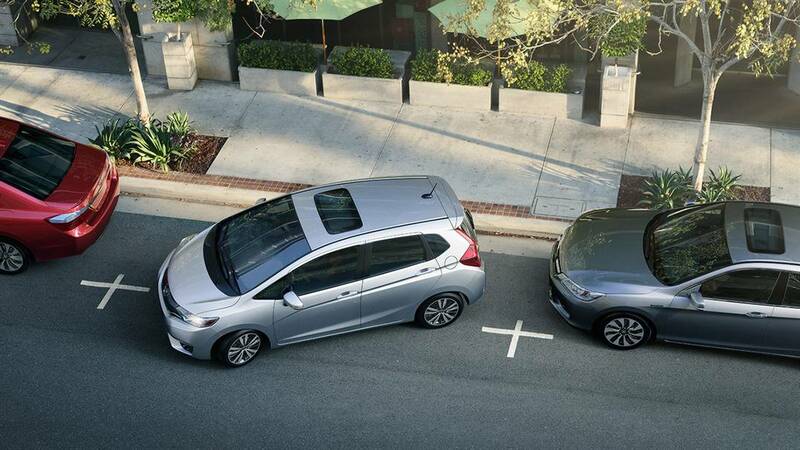 Take your safety the next level with the available Honda Sensing™ suite of active driver-assist technologies. These include Lane Departure Warning, Road Departure Mitigation, Forward-Collision Warning with Collision Mitigating Braking, and Adaptive Cruise Control. If you want to take a deep dive and learn more about Honda Sensing™, please visit https://automobiles.honda.com/sensing/. The result is that Hondas consistently earn some of the auto industry’s top safety ratings from the IIHS and the NHTSA. Plus, Honda’s are built to last with 78% of all Hondas built in the past 25 years still on the road, according to a recent IHS-Polk survey. And Kelly Blue Book (www.kbb.com) recently ranked the 2016 Fit as having the best resale value in the subcompact car category. We hope by now that we’ve convinced you that the 2016 Honda Fit is the perfect fit for your active, youthful lifestyle (we just love saying that). So what are you waiting for? Why not stop into a Valley Honda Dealer near you and check out the new 2016 Honda Fit for yourself? At a starting MSRP of just $15,890 it’s a whole lot of hatch for the money.